Create two separate custom roles for exporting and importing CM packages. The benefit of creating separate roles for export and import is that it provides flexibility and can be used to satisfy company policy. 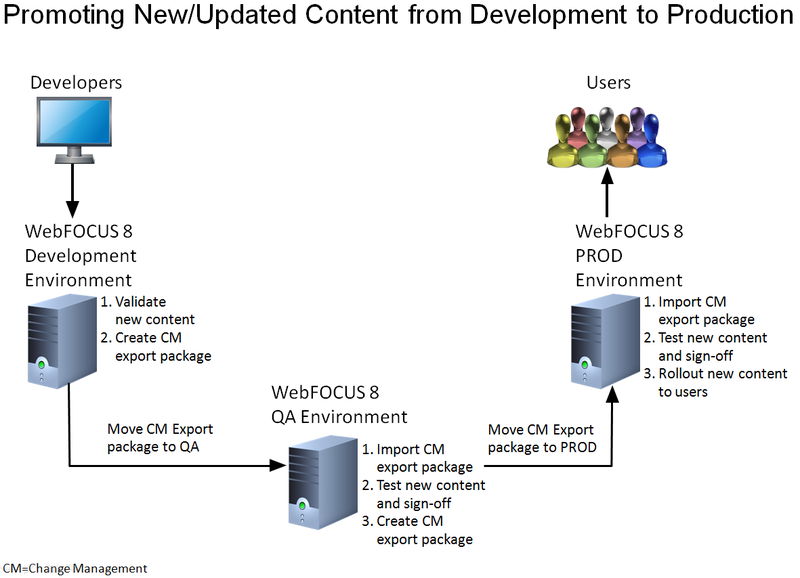 For instance, you may need to create these two custom roles because the company policy states that the same user is not allowed to export CM packages in QA and also import CM packages in PROD. The custom roles can further restrict what can be exported. For instance, if you do not want to export security resources, you can use the custom role to restrict the user from accessing the GROUPS node in the CM Export utilities. If you are using the Resource Templates, a custom Resource Template can be created to add the export and import roles and groups. Users can be added explicitly or AUTOADDED to the appropriate export and import groups so their privileges are additive to what they already have. The following topics detail several aspects of the general workflow for promoting content or content and security resources from Development through Production. This workflow is illustrated in the following image.